We’d love your help. Let us know what’s wrong with this preview of For Sizakele by Yvonne Fly Onakeme Etaghene. To ask other readers questions about For Sizakele, please sign up. The prose in For Sizakele is luscious yet easy to follow, and I read the entire book in one day because the characters captivated me so much. This is a book that glows with not only the author's culture but also queer identity and love of African/African diaspora women. The MC, Taylor, is a Nigerian-American student passionately devoted to her activism. She recites stirring poetry about identity at local events and brings social justice speakers to her community to inspire others. She knows who s The prose in For Sizakele is luscious yet easy to follow, and I read the entire book in one day because the characters captivated me so much. This is a book that glows with not only the author's culture but also queer identity and love of African/African diaspora women. Into that volatile situation comes Sy. She's African, like Taylor, and they bond instantly over shared diasporic sorrow, over shared food cravings, and over shared celebration of African women's beauty. They speak to each other not only in English but also French and in Pidgin, skipping merrily from language to language holding hands clasped tight with understanding. Their interaction is a wonderful, rich picture of friendship floating into love even as they deny that's what's happening. I was surprised that Taylor was bisexual, and one of her sources of conflict with Lee was Lee's insecurity about it. Readers who have dealt with biphobia in their own lives may find Taylor's stirring defense and rebuttal validating. When Lee wasn't spouting vitriol she also spoke some very real truths: that masculine-presenting women often aren't allowed to go about their lives without their hairstyle, clothing, etc. being read as some kind of deliberate statement. The way women like Lee dress and act has nothing to do with men, yet so many men see it as a blow to their specific ego. The resolution was satisfying and a happy ending, but it's not always necessarily obvious which relationship will win the way it is with some love triangles, so I'm not going to tell you! I think that shows deftness on the part of the author. The happy ending also has some ragged edges, but that just made it more realistic and believable for me. 1. there is nothing terrible or discriminatory about wanting "dyke" to be a lesbian exclusive term. I personally do not mind it when bi women who are not in relationships with men call themselves dykes but there is nothing biphobic re: lesbians having different feelings re: the reclamation of this slur. 2. butch women do have a harder time than femme women. i'm not butch or femme, but this is an obvious fact. it is not simply 'everyone has it hard but in different ways.' butch women have it harder. the end. and when people suggest that butch women don't experience sexual harassment from men, you're wrong and you should feel bad. 3. that the butch woman sexually assaults and chokes her girlfriend and that is parsed as being a result of her biphobia and femmephobia... and maybe also as the result of having experienced csa. why are you writing this narrative. i don't get why you would put all of this on your butch lesbian character. and how the femme character keeps on saying that in assaulting her, the butch lesbian was behaving as a man. this whole scenario of a butch woman having ~toxic masculinity. what's this. is every woman who sexually assaults someone else accused of having toxic masculinity, or is this just a weird way of saying that you hate butch lesbians because they are ~masc of center~ or whatever creepy garbage. how butch women are depicted as being monstrous, as being male, even by other lesbians and bi women... it's so depressing and disturbing and it needs to stop. 4. another butch lesbian does talk about how abuse is not acceptable for butch women, but it's interesting how this butch lesbian is introduced as talking about how she is still allowed to be a butch and wear lipstick. a kind of shoutout that some butches are okay - the butches who aren't that butch. I read this book in two sittings. Easily could have in one but I TRIED to savour it. It's a book that finds, in one sentence, a way to pull out a deeper part of you. And it does it with a sharp, but lush style. How can language be so textured and beautiful while also feeling so comfortable in your mind's voice? This is a work of true genius. This kind of writing is painstakingly crafted but flows easy like water for the reader. I'm reading it again because I can't remember the most beautiful phr I read this book in two sittings. Easily could have in one but I TRIED to savour it. Deep, painful love story...but worth every word. Lisa Moore has done it again: published a wonderful book that expands our sense of what is possible in the world. 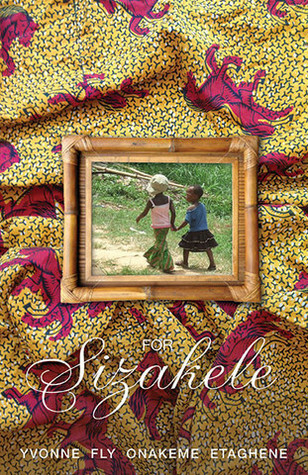 For Sizakele is a wonderful love story about young African American women with healthy doses of politics, slice of life in contemporary New York City, and a bit of poetry, too. Pick up this book today. For Sizakele by Yvonne “Fly” Onakeme Etaghene is a vibrant novel that gives voice to a community not often seen in literature, young African lesbians. The main characters deal with sexual abuse, partner violence, and finding the courage to love someone fiercely. The writing is captivating, the characters vividly drawn, and the message of owning the hurts and highs that come from opening yourself up to love is profound. The novel opens with a spoken word performance. Taylor, a Nigerian college stu For Sizakele by Yvonne “Fly” Onakeme Etaghene is a vibrant novel that gives voice to a community not often seen in literature, young African lesbians. The main characters deal with sexual abuse, partner violence, and finding the courage to love someone fiercely. The writing is captivating, the characters vividly drawn, and the message of owning the hurts and highs that come from opening yourself up to love is profound.